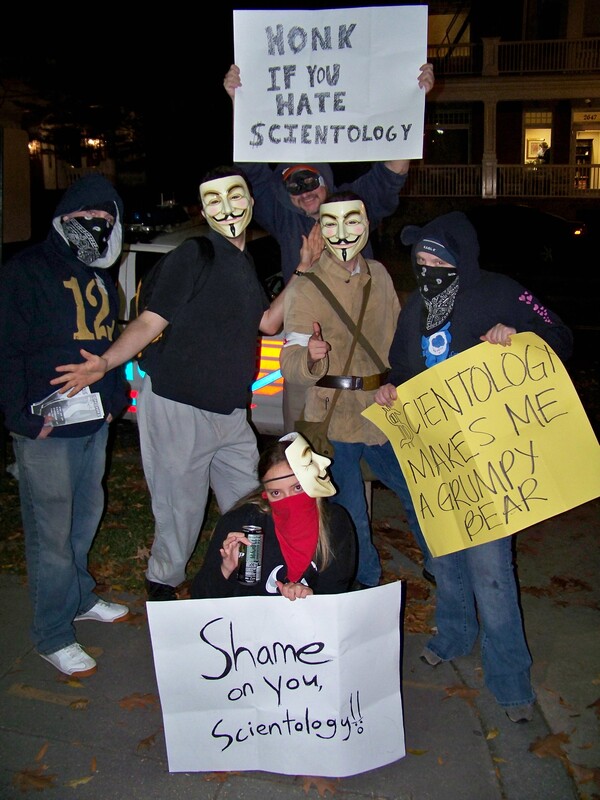 Anonymous DC had its monthly raid last night, and we had a blast. We started at the Org, and then moved on to the Marriott Wardman Park Hotel in Woodley Park, where Scientology was having their International Association of Scientologists (IAS) awards ceremony. 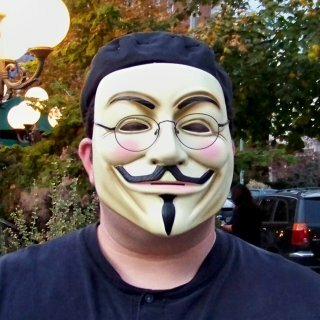 What I did was I took an old pair of glasses, put them in place on the mask, and then taped them there. 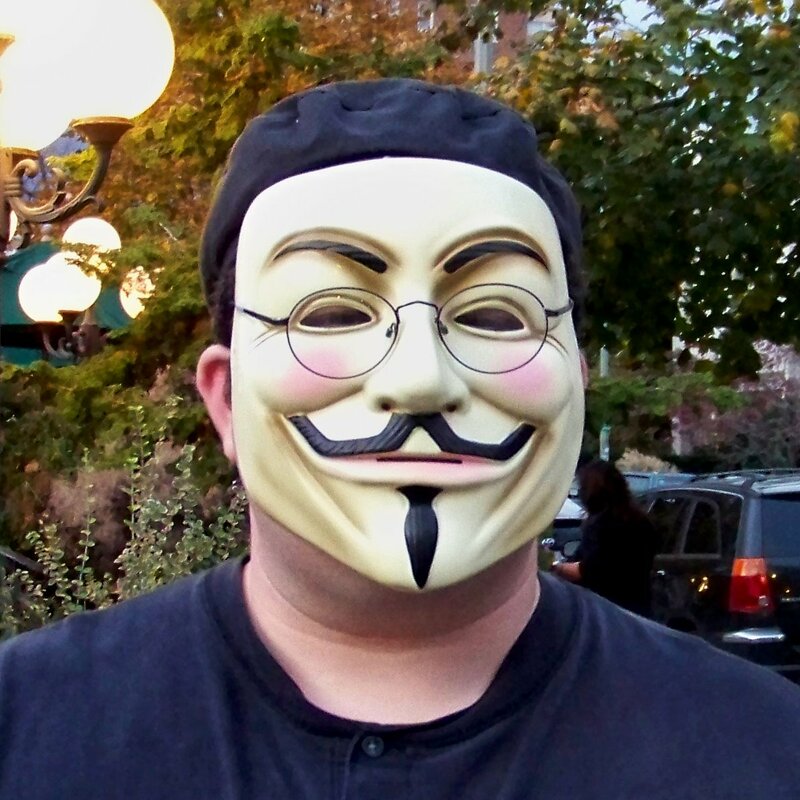 And for the Guy Fawkes mask, the nearly-round glasses from 2001-2005 worked out, though it did take a little bit to get used to the weaker prescription. I didn’t intend to use that pair, though, as my intention was to use the less-round glasses I used from 2005-2008, since the prescription is closer to my current pair. However, those now reside at work, and I forgot to take them home on Friday. Then afterwards, we all headed north on Connecticut Avenue to the Marriott Wardman Park, home of the IAS awards ceremony. The quickest way to get there was by Metro, since the Org is a block away from Dupont Circle station, and the Wardman Park is right next to Woodley Park-Zoo station. But as Anonymous is sometimes like herding cats, we ended up walking. Not a bad walk, but it was mostly uphill. 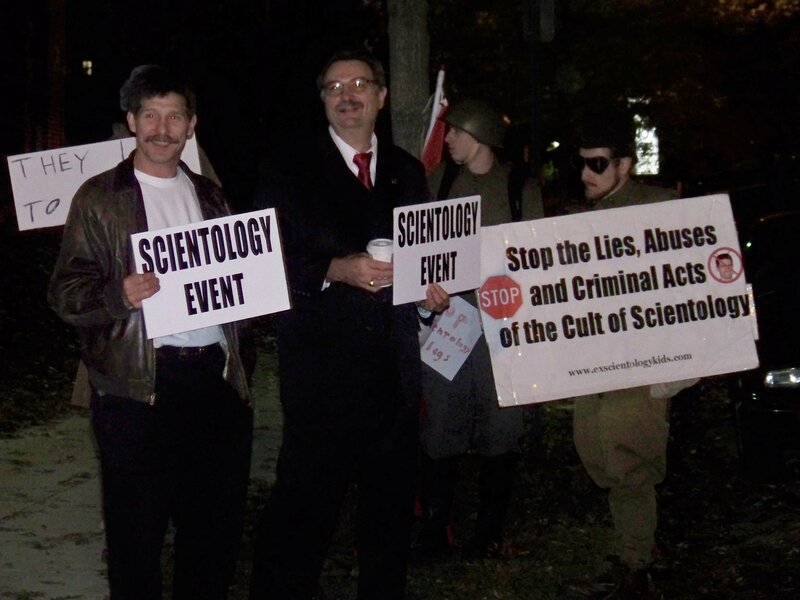 Arriving at the Wardman Park, we took up station at the main entrance, where cabbies and limos were coming in and out in large number, and a few Scientologists were standing at the entrance, holding signs that said “SCIENTOLOGY EVENT”. 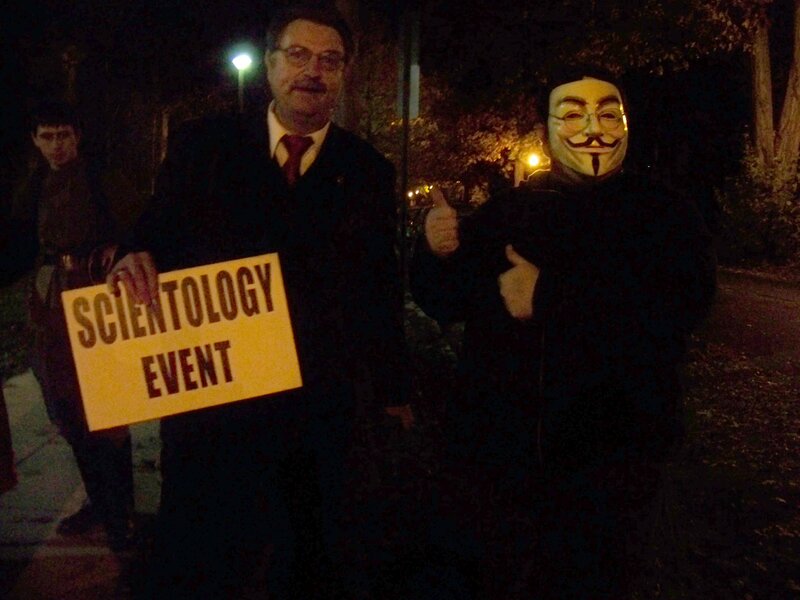 One can assume that Scientologists aren’t smart enough to understand that the Scientology awards event is being held at the Wardman Park without a person standing outside holding a sign. Holding up a sign for yousawthesign.com, which is an anti-Scientology site, similar to youfoundthecard.com. A play on Scientology’s “S” logo, indicating that Scientology is a scam. 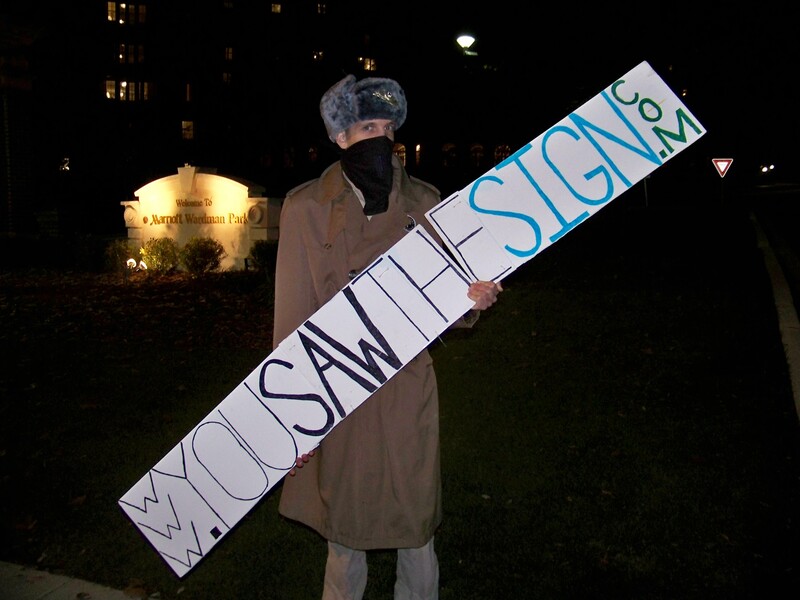 Posing with the sign man. 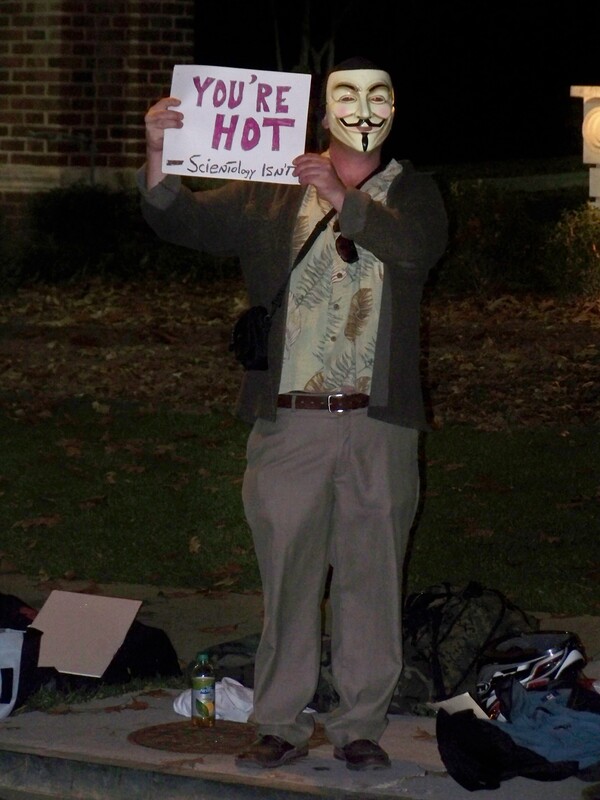 This was one of the more lighthearted signs, saying, “You’re hot – Scientology isn’t”. 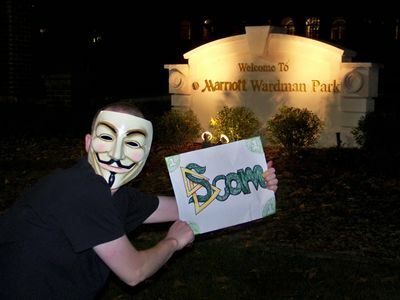 “Borat”, along with the original sign man, and two of our Anons. 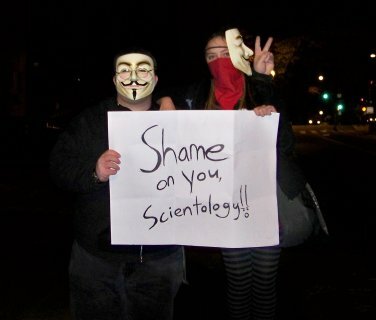 This Anon held a sign saying, “Shame on you, Scientology!” while wearing a bandanna over her face and the Guy Fawkes mask to the side. 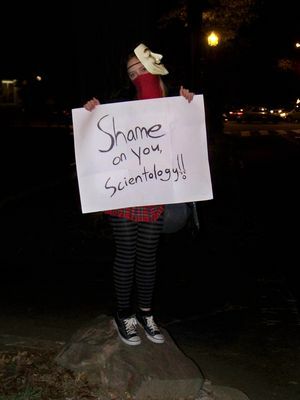 I pose with the “Shame on you!” sign. And like at the Org, the Scilons called the cops on us at the Wardman Park as well. We ultimately got three officers coming to say hello. Two regular officers, and a sergeant. And in the end: There wasn’t a thing that they could do about us, since we were completely in compliance with everything. 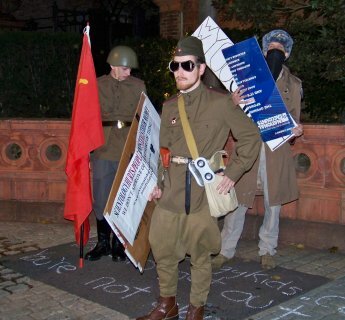 And we also got to say hello to all of these highly brainwashed Scilons, plus some of the Scilons that sometimes come out to screw with us, like Sue Taylor, Sylvia Stanard, “Camera Girl”, “Borat”, etc. Camera Girl was particularly lulzy tonight, as we asked her what OT level she was at, and she called that “personal information”, and then when we asked if David Miscavige, head of the “Religious Technology Center” and the Church of Scientology, would be present, Camera Girl replied that she doubted that “Mr. Miscavige” would be present, and even if it were the case that he was present, “you certainly wouldn’t get to meet him.” Camera Girl is so brainwashed, having been in Scientology all of her life, by her own admission. 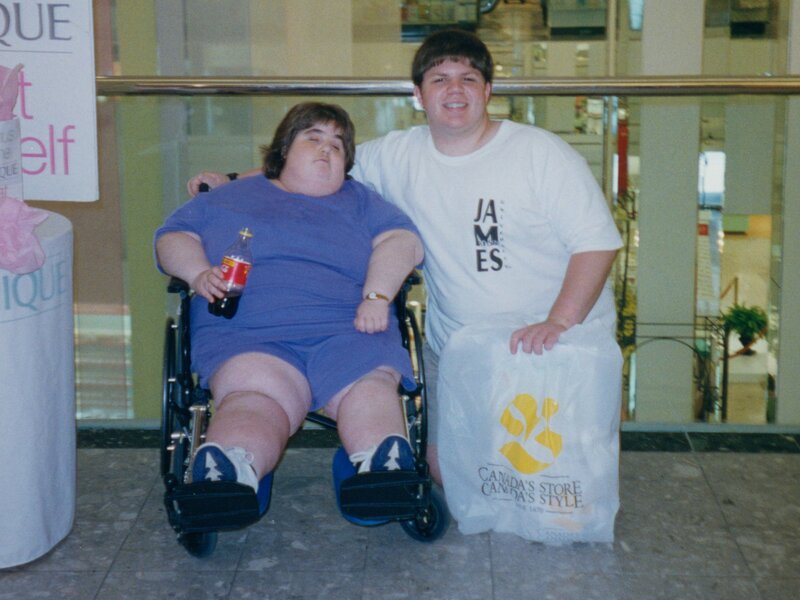 Poor girl. After we were finished raiding, we went to Chipotle, where we had dinner and got to socialize for a bit. After that, we took the Metro back home, with the Virginia people transferring at Metro Center, and the rest of us going way far down the line, with me, as usual, going the furthest, all the way out to Glenmont. All in all, we had a fun time! 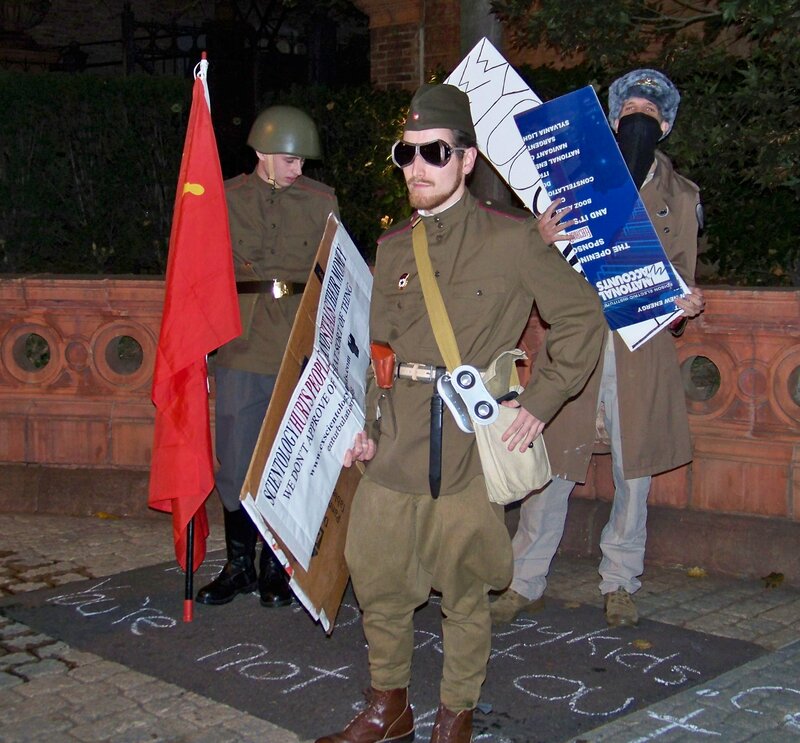 This was one of our smaller raids, but it was a lot of fun, we handed out a lot of flyers, and we had a nice change of scenery from our usual station outside the Org. Song: Theme to Car Talk, as I got to listen to the third half of their November 1 show on the way home. Quote: About the Free Stress Tests, by WLWT in Cincinnati. 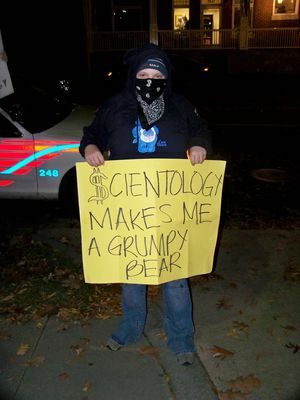 "Stress tests" are the "hook" that they use to recruit new wallets to their cult.